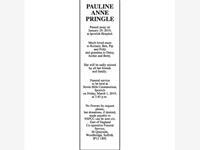 PAULINE ANNE PRINGLE Passed away on January 29, 2019, at Ipswich Hospital. Much loved mum to Richard, Ben, Pip and Polly and grandma to Daisy, Archie and Betty. She will be sadly missed by all her friends and family. 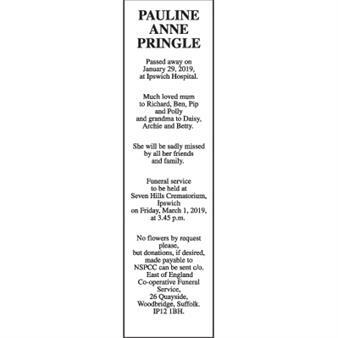 Funeral service to be held at Seven Hills Crematorium, Ipswich on Friday, March 1, 2019, at 3.45 p.m. No flowers by request please, but donations, if desired, made payable to NSPCC can be sent c/o. East of England Co-operative Funeral Service, 26 Quayside, Woodbridge, Suffolk. IP12 1BH.